Earlier this week, my free tree seeds from the Woodland Trust arrived. 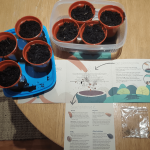 So I got up early this morning and starting growing trees. Apparently, the seeds include Rowan, Dog Rose, Alder Buckthorn and Holly. Although there did seem to be a lot of seeds. I may have been unwittingly planting debris that came in the packet! At least I can be sure I didn’t miss any seeds. More information about trees and planting can be found at the Woodland Trust website.